This blog post started out completely differently. I woke up this morning and naturally logged into Twitter to see what news I missed while I was sleeping. I was surprised to discover what I thought was a new feature on Twitter.com, a new popup when I hover my mouse over a shortened link or a person’s name. Twitter has been working hard on implementing new features over the past few months, some more successful than others, and I thought this was just another new functionality to add to the collection. What seems to be the direction Twitter is taking is releasing new features for the Web interface, which in the long run will help Twitter’s numbers continue to rise. Over the past few months, the statistics show that the number of people accessing Twitter is in decline. Does that mean less people are tweeting? Absolutely not! On the contrary, Twitter, for the better or the worse, is becoming more and more mainstream. The decline in numbers is primarily because more people are using 3rd party applications that access Twitter through its API, and less people are using the actual website. This of course is something Twitter wants to control, so they are adding these new features, such as lists (Tweetdeck groups), RT Button (all the clients have it), and the latest addition being added gradually is Contributors. So, when I saw a popup when hovering over links and people’s names on Twitter, I automatically figured Twitter added this feature to compete with clients like Tweetdeck, that display the number of followers a person has, right under every tweet. I started writing this post about Twitter and how it is improving every day, and when I searched Twitter for people’s opinions on this new popup, it was nowhere to be found. I searched for the word popup, I searched for the word Twitter (lot of spammers on that word), and no matter what I searched for, no one was talking about this new feature. Something did not make sense here. I then remembered that I have been very busy at installing Chrome extensions, so I figured maybe it was one of my many extensions that was giving me this popup. So the natural next move was to dig up Internet Explorer from somewhere deep in the archives of my PC, and check if this popup appears when accessing Twitter in IE. It didn’t. My first emotion was disappointment. This is a perfect idea for a Twitter feature, one that would give the Web interface a clear advantage over Twitter applications. It would enable users to see what links are behind the shortened URL, as well as view basic and important information about any Twitter user without checking out their profile. However, this was not a Twitter feature, it was a Chrome extension feature. Now all I had to do was find out which one it was, and share it with you. After a few minutes of disabling and enabling multiple extensions, it became clear to me that it was in fact the Bit.ly extension that was giving me this popup. Bit.ly is the most popular URL shortening service on the Web. URL shorteners is yet another very hot space right now with the number of available services standing somewhere in the thirties, at least. This week, the big news was that Google and Facebook both announced their own URL shortening service, taking this industry that did not exist, or was completely insignificant before Twitter came around, into the major leagues. So what is a URL shortener? For those of you who do not use Twitter yet, and cannot figure it out from the name, it is a website that takes a URL, no matter how long it is, and creates a shorter one, which enables you to share that link on Twitter. Why is this important? Simply because Twitter gives you 140 characters to share the information and if you are going to use regular URLs, most of those 140 will be taken up by the link and not by the information you are trying to share. The name of the game is who can make URLs shorter? I used to use Tinyurl.com, till I found Bit.ly. That became outdated quickly when I first encountered is.gd, which is the service I use as my default now. The competition in this space is heating up so much that the various companies are trying their hardest to be creative in giving themselves an edge. Bit.ly enables you to track how many times the link was sent, and provides analystics about your link, something that is an important feature for anyone interested in the concrete results of social media. Once again, the fact that Google and Facebook are entering this space is a clear indication that it is here to stay. Another “Edge” that bit.ly now has over its competition is this Chrome extension. The features included in the Bit.ly extension are many. For starters, there is popup I discussed before. This is huge, and for the first time since I first opened Tweetdeck, I am now using the Web interface to read Twitter. I am sure I will still use Tweetdeck, but this definitely makes the Web interface more appealing. However, the Bit.ly Chrome extension does so much more. When you are viewing a web page, click the extension’s icon and it opens up a sidebar that is absolutely packed with information about the site you are viewing. For starters, you can sign in to Bit.ly from the sidebar, which enables you to view your personal statistics about the sites you have shared using a Bit.ly URL. The next thing the sidebar does is automatically generates a tweet for you including the title of the page you are viewing as well as a shortened link. All you have to do is select where you want to share this. The options are Gmail, other email services, Facebook, or Twitter. That is just the beginning. The sidebar shows you exactly how many times this page has been tweeted, posted on Facebook, or shared on Friendfeed.Amazingly enough, it also shows you the exact tweets including the people who did the tweeting. Why is this useful? Imagine you are very interested in rocket science. You are reading an article on the Web about the topic, and you click the Bit.ly icon. You are now able to see other people who have read and shared this specific article, thereby finding people who share your interest with whom you can connect. The extension has got to be the most feature packed Chrome add on I have encoutered yet, and I would highly recommend installing it whether you are a social media user or not. The benefits of such an extension are countless, and I for one am even willing to give up on one extra letterin my tweets so I can use Bit.ly and not is.gd. Bit.ly has done a great job so far staying ahead of the competition, and at this rate, I am voting for them even of it means taking on industry giants like Google and Facebook. Bit.ly deserves to win this war. Have you tried this extension yet? Do you use Bit.ly? Would love to hear your thoughts in the comments. This blog post started out completely differently. I woke up this morning and naturally logged into Twitter to see what news I missed while I was sleeping. I was surprised to discover what I thought was a new feature on Twitter.com, a new popup when I hover my mouse over a shortened link or a person’s name. Twitter has been working hard on implementing new Twitter features over the past few months, some more successful than others, and I thought this was just another new functionality to add to the collection. This of course is something Twitter wants to control, so they are adding these new features, such as lists (Tweetdeck groups), RT Button (all the clients have it), and the latest addition being added gradually is Contributors. So, when I saw a popup when hovering over links and people’s names on Twitter, I figured Twitter added this feature to compete with clients like Tweetdeck, that display the number of followers a person has, right under every tweet. So the natural next move was to dig up Internet Explorer from somewhere deep in the archives of my PC, and check if this popup appears when accessing Twitter in IE. It didn’t. My first emotion was disappointment. This is a perfect idea for a Twitter feature, one that would give the Web interface a clear advantage over Twitter applications. It would enable users to see what links are behind the shortened URL, as well as view basic and important information about any Twitter user without checking out their profile. However, this was not a Twitter feature, it was a Chrome extension feature. Now all I had to do was find out which one it was, delete what I had written so far, then write a new post about the extension. So what is a URL shortener? For those of you who do not use Twitter yet, and cannot figure it out from the name, it is a website that takes a URL, no matter how long it is, and creates a shorter one, which enables you to share that link on Twitter. Why is this important? Simply because Twitter gives you 140 characters to share the information and if you are going to use regular URLs, most of those 140 will be taken up by the link and not by the information you are trying to share. The name of the game is who can make URLs shorter? I used to use Tinyurl, till I found Bit.ly. That became outdated quickly when I encountered is.gd, which is the service I use as my default now. The competition in this space is heating up so much that the various companies are trying their hardest to be creative in giving themselves an edge. Bit.ly enables you to track how many times the link was sent, provides analystics about your link, along with many other advanced features, which are important feature for anyone interested in the concrete results of social media. Once again, the fact that Google and Facebook are entering this space is a clear indication that this industry is here to stay. The extension has got to be the most feature packed Chrome add on I have encoutered yet, and I would highly recommend installing it whether you are a social media user or not. The benefits of such an extension are countless, and I for one am even willing to give up on one extra letter in my tweets so I can use Bit.ly and not is.gd. Bit.ly has done a great job so far staying ahead of the competition, and at this rate, I am voting for them even if it means taking on industry giants like Google and Facebook. Bit.ly deserves to win this war. 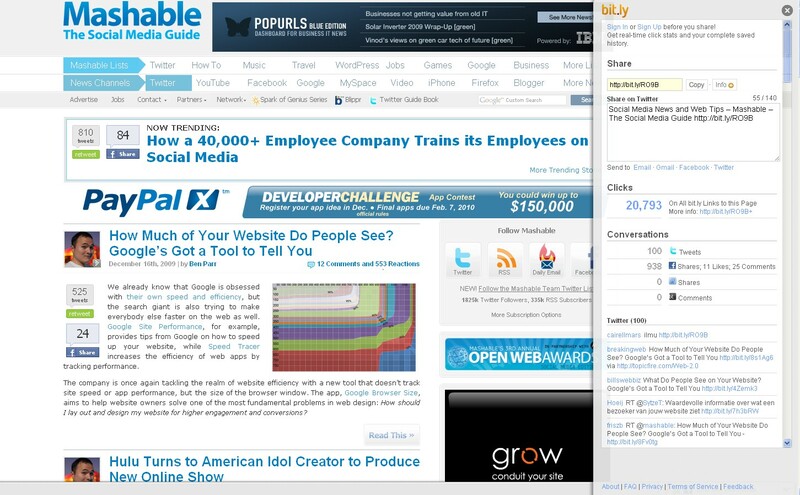 It’s not exclusively a Chrome extension – it’s a couple of bookmarklets from bit.ly that work on most browsers. I’ve been using the sidebar in Firefox for months now.